Carpal tunnel syndrome exercises are more successful in patients with mild symptoms, and are not recommended for patients with severe symptoms. Patients who have persistent symptoms despite these exercises should discuss surgical treatment with their physician. Here are some carpal tunnel syndrome exercises intended to help prevent occurrence of the condition. Remember doing a quick five minute exercise warm-up before starting work, just as runners stretch before a run, can help prevent work-related injuries. When performed regularly, certain carpal tunnel syndrome exercises can help to improve symptoms. These exercises are designed to stretch the forearm muscles and reduce tension on tendons that pass through the carpal tunnel and to help strengthen the muscles. Many carpal tunnel syndrome exercises for may also help prevent carpal tunnel syndrome in the first place. For better performance of these carpal tunnel syndrome exercises, it is important to understand the condition first. Carpal tunnel syndrome (CTS) is a compression neuropathy of median nerve. It is constriction of median nerve as it passes beneath the flexor retinaculum. Carpus is a word derived from the Greek word "karpos" which means "wrist." CTS, or median neuropathy at the wrist is a nerve disorder in the wrist that causes pain, hand weakness, loss of feeling often in the thumb and the first three fingers. It involves compression, stretching, irritation, of median nerve at the wrist joint and may greatly decrease athletic performance involving strong hand and wrist actions. The carpal canal at the wrist joint is a cramped space, crowded with flexor tendons and the median nerve. Any tension in this canal can compress the median nerve. It is more common in women than in men and occurs typically later in life (40-60 yrs). Sometimes it is seen in young individuals secondary to trauma. Night symptoms and waking at night— the hallmark of this illness— can be managed effectively with night-time wrist splinting in most patients. The role of medications, including corticosteroid injection into the carpal canal, is unclear. Surgery to cut the transverse carpal ligament is effective at relieving symptoms and preventing ongoing nerve damage, but established nerve dysfunction in the form of static (constant) numbness, atrophy, or weakness are usually permanent and do not respond predictably to surgery. The carpal tunnel is an inelastic fibro-osseous tunnel defined by the carpal bones and the flexor retinaculum. Flexor retinaculum is a strong fibrous band which bridges anterior concavity of carpus and converts it into carpal tunnel. The upper border is formed by joining the first and the second points, and the lower border by joining the third and fourth points. Medially to the pisiform bone and to the hook of the hamate. Laterally to tubercle of scaphoid, and the crest of the trapezium. (i) the tendon of palmaris longus,(ii) the palmar cutaneous branch of the median nerve,(iii) the palmar cutaneous branch of the ulnar nerve;(iv) the ulnar vessels; and the ulnar nerve. (i) the median nerve,(ii) the tendons of the flexor digitorum superficialis,(iii) the tendons of the flexor digitorum profundus,(iv) the tendon of flexor pollicis longus,(v) the ulnar bursa, and (vi) the radial bursa. Any space occupying lesion within the carpal tunnel may be responsible. A number of factors may contribute to the condition and these generally fall into one of the following categories. Inflammation of the flexor tendon sheath (tenosynovitis) as a result of repeated or sustained flexor activity (gymnast, cyclists). Scarring and shortening of the ligament that covers the median nerve. Arthritic changes secondary to a colle's fracture. Other causes which may cause stretching of the nerve is prolonged hyperextension or hyperflexion. Diabetes, hyperthyroidism, pregnancy, rheumatoid arthritis, gout, ganglion cyst, prolonged forceful weight bearing on hands, tasks that require repetitive hand or wrist actions. Paraesthesias (numbness, burning, tingling) is felt over the first three fingers (radial) and radial half of the fourth. the condition increase at the night when there is additional problem of normal lower resting blood pressure. Variable relief from nocturnal symptoms is obtained by hanging the arm over the side of the bed or shaking the hand, actions which increase the resting blood pressure and hence blood supply to the nerve. Sharp pain that may shoot from the wrist up the arm or to the fingers, especially at night. The hand may be clumsy and weak. Morning stiffness or cramping of hand. Thumb weakness, frequent dropping of objects, inability to make a fist. Shiny, dry skin of hand. Reduced performance in any sport requiring grip. 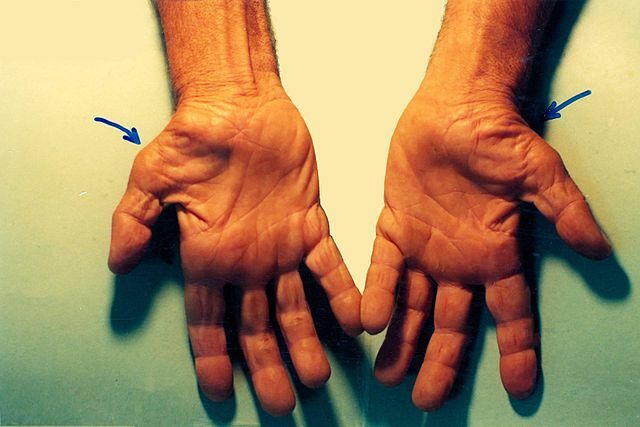 In a severe case, there may eventually be evident wasting and weakness of the median nerve innervated small muscles of the hand. Entrapment of C6/7 nerve root which does not give increased pain to repeated wrist movements. Osteoarthritis of base of thumb. 1) Phalen's test- The examiner flexes the patient's wrist maximally and hold this position for one minute by pushing the patient's wrist together. A positive test is indicated by tingling in the thumb, index, middle and lateral half of ring fingers caused by pressure on the median nerve. 2) Reverse phalen's (prayer) test- The examiner extends the patients wrist. The examiner then applies direct pressure over the carpal tunnel for 1 minute. Positive test produces same symptoms. 3) Tinel's sign at the wrist- The examiner taps over the carpal tunnel at the wrist. A positive test causes tingling and paraesthesia into the thumb, index, middle and lateral half of the ring finger. 4) Carpal compression test- The examiner holds the supinated wrist in both the hands and applies a direct even pressure over the median nerve in the carpal tunnel for upto 30 seconds. Production of patient's symptoms is considered a positive test. CTS, patients will usually be tested electrodiagnostically with nerve conduction studies and electromyography. The goal of electrodiagnostic testing is to compare the speed of conduction in the median nerve with conduction in other nerves supplying the hand. When the median nerve is compressed, as in CTS, it will conduct more slowly than normal and more slowly than other nerves. There are many electrodiagnostic tests used to make a diagnosis of CTS, but the most sensitive, specific and reliable test is the Combined Sensory Index (also known as Robinson index). 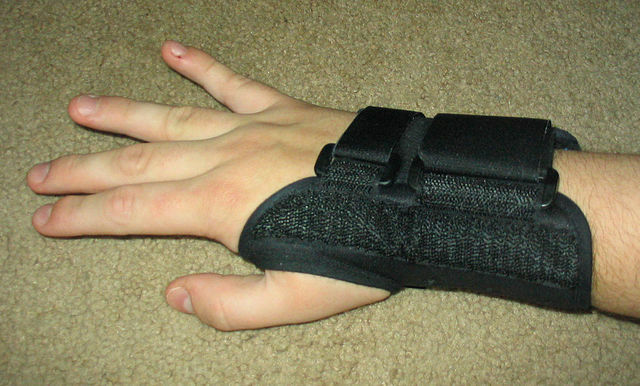 1) A splint to prevent hyperflexion or hyperextension of the wrist, mainly at night. 4) TENS for pain relief. 5) Massage- Massaging is produced in a particular pattern to attenuate the tendons, as well as to drain fluid from the inflamed carpal tunnel. This combined effect reduces the pressure inside the carpal tunnel and therefore reduces pain caused by median nerve compression. 7) Carpal tunnel syndrome exercises- Gentle relaxed passive movements or active assisted or active movements are given in the pain free range.Stretching and strengthening exercises can be helpful in people whose symptoms have abated. These carpal tunnel syndrome exercises may be supervised by a physical therapist, who is trained to use exercises to treat physical impairments. These carpal tunnel syndrome exercises are discussed in detail at the end of this age. 8) If it fails local corticosteroid injection may be given. 9) In severe cases,surgery may be required. Full relief is gained by dividing the flexor retinaculum to decompress the nerve. Surgery is not recommended in CTS if it is the result of repeated jolting and shaking of the hand or to prolong hyperextension, because in this CTS is caused by stretching of the nerve and not compression. Keep hand in neutral position. Avoid activities that require Repetitive hand and wrist functions such as hammering. Avoid prolonged grasping, such as holding newspaper, steering wheel, pen, shopping bag etc. Avoid pinching activities like needle work and writing. -Encourage wrist extension and flexion exercises and full finger flexion and extension immediately after surgery in the post surgical dressing. -Discontinue the wrist splint if the patient is comfortable. -Permit the patient to use the hand in activities of daily living as pain allows. -Remove the suture and begin range of motion and gradual strengthening exercises. -Achieve scar remodelling and scar massage. -Control pain and edema with the use of elastic gloves. -Advance the patient to more vigerous activities. -Allow the patient to return to work, if pain permits. -The patient can use a padded glove for tasks that require pressure to be applied over the tender palmar scars. There are several different treatment options for carpal tunnel syndrome. Exercises are one option often recommended by healthcare providers or physical therapists. Carpal tunnel syndrome exercises are designed to stretch the forearm muscles and reduce tension on tendons that pass through the carpal tunnel. They may also help strengthen the muscles. Exercise by itself may be helpful for treating carpal tunnel syndrome, but is probably most helpful when combined with other carpal tunnel treatment options, including splinting and activity modifications. Make sure to talk with your healthcare provider or physical therapist about exercises that make the most sense in your particular situation. Some exercises are only recommended after symptoms have improved. Many of these same exercises may also help prevent carpal tunnel syndrome in the first place. If you perform a job that keeps your hands in one position, you may want to incorporate these preventive exercises into your daily routine. Tendon gliding and median nerve-gliding exercises are two types of exercises that may help with carpal tunnel syndrome. These exercises are thought to relieve pressure on the median nerve and stretch the carpal ligaments, which also helps decrease pressure. They are also thought to help blood flow out of the carpal tunnel, which can help decrease fluid pressure. Research on the benefits of these exercises has been mixed. Some research has shown that these carpal tunnel exercises can improve symptoms and decrease the need for surgery. Other studies have shown improvements in grip strength, but no other effects on symptoms. People with mild to moderate carpal tunnel syndrome seem to benefit the most from these exercises. Make a full fist and then return to a straight hand. Hold each position for seven seconds, and do 10 repetitions. Repeat three times to five times a day. Use your other hand to gently pull your thumb farther away from your palm. Hold each position for seven seconds, and do five repetitions. Repeat three to five times a day. After doing repetitive movements for awhile, you can sometimes cancel out the effects of those movements by flexing and bending your wrists and hands in the opposite direction. For example, after typing with your wrist and hand extended, it is helpful to make a tight fist and hold it for a second, then fan out the fingers and hold for a few seconds. Repeat this five times. You can also stretch the neck and shoulder muscles. While standing, place your left hand on top of your right shoulder. Hold that shoulder down while tipping your head to the left. Keep your head looking forward, and hold for five seconds. You should repeat this stretch on the other side. Shoulder shrugs may also help. For this exercise, stand with your arms at your side. Then raise your shoulders straight up, squeeze your shoulders back, then stretch your shoulders down, then move them forward. It should take 7 to 10 seconds per rotation. Repeat five times. Huisstede BM, Hoogvliet P, Randsdorp MS, Glerum S, van Middelkoop M, Koes BW. Carpal tunnel syndrome. Part I: effectiveness of nonsurgical treatments--a systematic review. Arch Phys Med Rehabil. 2010 Jul;91(7):981-1004. Piazzini DB, Aprile , Ferrara PE, Bertolini C, Tonali P, Maggi L, Rabini A, Piantelli S, Padua L. A systematic review of conservative treatment of carpal tunnel syndrome. Clin Rehabil. 2007 Apr;21(4):299-314. Carpal tunnel syndrome. A.D.A.M. Medical Encyclopedia.